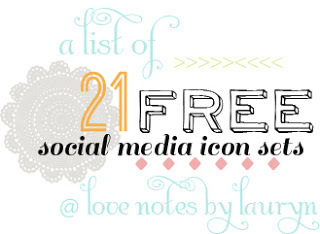 **Update: It's been a while since I wrote this post, so it's possible that some (or all) of the links to free social media icon sets that I have provided below, might or might not still be available. If they are no longer viable, I apologize, but it's pretty simple to find other sites that do have them. Just do a search for "free downloadable social media icon sets" (without the quotation marks, of course) and you'll find tons of them. Now... My anti-virus softwear has a feature that lets me know right on the search results page, if a site is safe for me to visit or not, but if yours doesn't do that for you and you are wary of just clicking on any old link, you can follow the advice provided by one of my favorite go-to sites for all things interwebs, C|Net. Welcome to the newest installment of my tutorial series; "Bling Out Your Blog"! Please note: These instructions are for Blogger (blogspot) hosted blogs only. I'm not familiar with the inner workings of Wordpress, Typepad or other blog hosting sites, but I'm sure if you do a search, you can easily find someone who can help you. Also, I'm not a web designer. I've learned most of what I know from my fellow bloggers or trial and error. I'm certainly open to questions about my tutorials, but please know that if you ask highly technical questions about code etc., I probably won't be able to answer them for you. So... Why is it a good thing to install a social media icon bar on your blog? OK. Let's get to it, shall we? If you don't know where or how to find icon sets, here's a link to a Pinterest board that I found with pins of different sites that offer them. I can't vouch for the authenticity of every single site listed on this board, but I found several good sites and if you have a Pinterest account, I'm sure you already know how to check the website or source of a pin. ( Fair warning: I went through a lot of them before I found the right ones for me - There are so many, it can become a bit of a distraction. lol) You can also find a plethora of sites by doing a general web search for "free social media icons". And of course, there are also sites that offer full sets of icons for a just few bucks, if you don't mind paying for them. Many of these sites will even customize them to match your blog design and will also work up the codes that you need for a little more. It's totally up to you. I also found this Etsy shop that does really cute hand drawn sets for about $5 or $6 (US) per set. The size that I use here on SOTKT is 64px and the size that I use over on my other blog, Go Ahead Take A Bite is 48px, but you can choose whatever size will fit best in the location you choose to put them. The two sizes that I listed above simply wouldn't fit in my sidebar, so I ended up putting it above the "Blog Posts" area in my layout. Didn't know that you could put stuff there? Neither did I, until one night, (out of pure frustration) I decided to try it. Whattayaknow? It worked! Of course, you can always resize your side bar in the template designer. If you don't know how to do this, you can find the instructions that were included in a previous tutorial, HERE. Next, you need to gather up the URL's (the www. address) for the social media sites that you want to represent, in a work space. I have a test blog that I keep private and use for editing and trying out different apps and layouts for my public blogs, but you can use Notepad, Word, Google Docs, etc. You just need a space where you can copy and paste things together, before placing your finished icons in your blog layout. In the Basic section, scroll down to "Permissions"
To the right of where it says "Blog Readers" click "edit"
Now, you can add the entire block as a text/html gadget to your blog layout. Et, voila! You have a personalized social media follow bar! For instructions on finding the URL for your Blogger (blogspot) RSS feed: Click HERE. If you have a Facebook page for your blog, just go to the main or home page and copy and paste the URL that's located in the address bar. This is also called the permalink address. For Bloglovin', Pinterest, LinkedIn, Twitter, etc. you just do the same. I do not use a social media icon for email subscriptions. I've found that it's much easier to keep track of my subs by using the available (Feedburner) Blogger widget for email subscriptions in my sidebar. There's a cute little video called "RSS in Plain English" that explains what an RSS subscription is: HERE. I hope that I've explained this so that it's understandable. If you have problems or questions of any kind, please let me know and I'll do my best to help in any way that I can. I hate Social Media. I know that we live in a time when Social Media is the rage, but I really can't stand it. I went off of Facebook for months. I am now back on, but pretty much just to play a few games that I like. I noticed today that they changed the Timeline format (again). Gah. I hate it. And every time I turn around they are giving away your personal information by changing those settings. I refuse to open a Twitter account. Ergo, I won't do any other Social Media, either. If I didn't already have my blog, I probably wouldn't do THAT. Ha! However, you did make me laugh. You used one of my all-time favorite words in this post: plethora. Love.That.Word.